AJOSE OLUSEGUN: "ERIK MORALES, DO THE HONORABLE THING...GIVE ME MY SHOT"
Ajose Olusegun (30-0 14 KO's) has traveled the long road in boxing. The Nigerian-born, 31-year-old super lightweight recently moved to the United States last year from the United Kingdom seeking the one thing eluding him for over two years, a shot at the title. Now the WBC #1 contender, he refuses to wait any longer. Still a relative unknown in the United States, Olusegun got his first shot at serious American exposure in late September when he headlined the main event on ShoBox. He easily outpointed Ali Chebah to become the #1 contender for the WBC title. "I think it was a good performance. Ali Chebah is a good opponent who came out to fight and to win. I knew it wasn't going to be an easy fight, but I'm glad I won unanimously and the American people now know what I can do. There was a lot at stake in that fight. 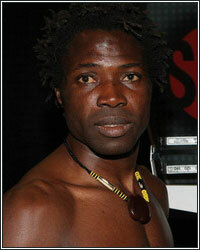 The winner fights for the WBC title," Olusegun commented on the performance. That title is currently held by Mexican legend Erik Morales, who defeated Pablo Cesar Cano for the vacant title on the undercard of the Mayweather vs. Ortiz pay-per-view. Olusegun is ready for his time to shine. "I've done what I'm supposed to do. I'm now the mandatory challenger and gone the long route. Now for Morales, he needs to be the honorable person and fight me. A lot of people didn't know about me before I got to the U.S. They saw what I can do now and very soon, everyone will see what I can do. Put anyone opposite me in the ring and I'll win. I'm coming for my title," he remarked, making it clear that he's eager for Morales to give him his shot at the title. In fact, Olusegun doesn't believe Morales even deserved the chance to fight for the title in the first place. "For me Morales is a great fighter, a champion, a living legend, but he wasn't supposed to fight for it, I was. I was already the mandatory and fought two weeks after he did in an eliminator. That should have been my shot. Now he is the champion; I'm the mandatory. It's the WBC rules," he explained. "Either fight me or relinquish the title. I want to fight him. I wanna get my shot. I waited for so long. I was #1 contender for 2 years and never got my shot. I'm not accepting anything less than my shot. If you beat me, then go along with your career." Though Olusegun has yet to beat a household name, he believes it's due to the lack of fighters willing to get in the ring with him. "It's because the champions didn't want to fight me and they know I'm better than them. I was also not living in the U.S. I'm going the long route and I won my eliminator. I moved to the U.S. to get my exposure and I'm now the mandatory and I want my shot," he added. "I've been here for about a year now...Morales, you are an honorable man, and the champion, even though you're not supposed to be. Do what champions do and fight the mandatory. If you beat me, I'll give you respect, but you won't beat me and I'm gonna take my title." Morales is tentatively scheduled to fight next December 10th against an opponent yet to be determined. Olusegun says his promoter, Lou Dibella, is working hard to gain contact with the WBC and Morales' people to put something together. "I'm ready tomorrow to get in the ring if I have my way. I wanna get in the ring as soon as possible...Erik Morales, do the honorable thing and give me my shot at the title." Email comments to dkassel@fighthype.com, "Like" The Boxing Observer on Facebook, and follow me on Twitter @BoxingObserver.